On May 4th 1900 a public meeting was held in the Pavilion, Castlerock for the purpose of considering the advisability of laying down golf links at the resort and of making the preliminary arrangements. The inauguration meeting of this prosperous club took place in the Pavilion on Tuesday afternoon of 16th April 1901, the Rev. William Irwin, D.D., occupying the chair, when a large body of members met together to appoint a council for the season. It was also agreed "That the best thanks of the members be tendered to Sir H. Hervey Bruce and Colonel Bruce for their kindness and generosity in placing such a large tract of ground at the disposal of the club for the purposes of golf." By this time the trustees had erected a handsome and commodious clubhouse on the ground, and the links had been carefully and satisfactorily laid out. What is now described as the formal inauguration of the new links of Castlerock took place on Saturday June 22nd 1901, in the afternoon with an open stroke competition for prizes valued £3, £2, and £1-0-0. The event evoked much interest and there was a large attendance of the general public as well as golfers. The winner was J. Hunter Steen - Cheltenham G.C. Gross 84, H. 5, Nett 79 but unfortunately, however, the weather turned out disagreeable for all. In 1906 the A.G.M. empowered the Council to enter negotiations for the leasing of extra land sufficient to provide an additional nine holes, thus making the course one of eighteen holes. It was susequently reported at the following Annual General Meeting on 8th May 1909 that the Council had entered into negotiations with the tenants adjoining the 9 hole course, and succeeded in arranging with Mr. James Dugan and Mr. Robert Dugan for sufficient ground to make an additional nine holes at an increased rent of £24 and £18-10s respectively for a thirty-eight years' lease. Sir H.J.L. Bruce, who took a keen interest and gave great assistance in all the proceedings connected with the extension, extended the lease of the ground held under him for a like period at the nominal rent of 5s per year for which the Club tendered its heartiest thanks. 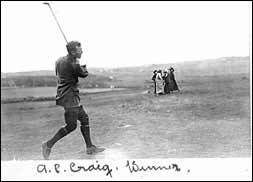 The Formal Opening of the New Eighteen Hole Course was carried out by Sir Hervey and Lady Bruce on 15th July 1909 when the former drove the first ball from the first tee, in the presence of a large number of ladies and gentlemen, and declared the new course open for play. The opening competition then took place with 18 holes medal play under handicap with an entry of over 30 players, but only four cards were returned. Mr. A.H. Craig - Gross 89, H. Scr. Nett 89. Mr. J.C. Glendinning - Gross 102, H. 13, Nett 89. Mr. J.G. Magee - Gross 110, H. 21, Nett 89. Mr. W.J. Donnell - Gross 99, H. 9, Nett 90.